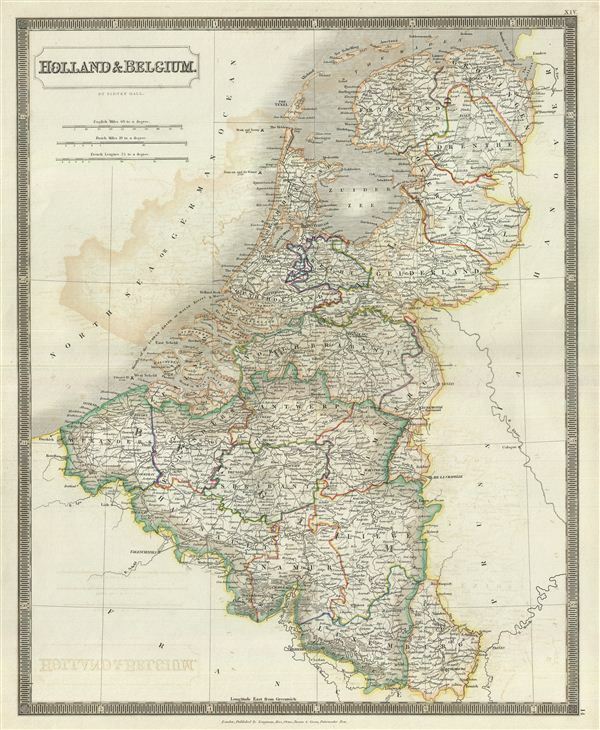 This is a beautiful map of Holland (the Netherlands) and Belgium from Sidney Hall's extremely scarce 1835 New General Atlas. It covers from the North Sea to Luxembourg. The 'Forest of Ardennes' in southern Belgium is beautifully rendered. Towns, rivers, mountains, railroads, canals, marshes, forests, and various other important topographical details are noted. Elevation throughout is rendered by hachure and political and territorial boundaries are outlined in color. The map identifies the sites of several important battles, including the 1653 battle fought by Edward III, the Battle of Texel with George Monck and Maarten Tromp, and the 1797 Battle of Camperdown with Adam Duncan and Jan de Winter. In 1830, the Belgian Revolution led to the secession of Belgium from the United Kingdom of Netherlands and it's subsequently consolidation as the independent Kingdom of Belgium. Though Belgium had successfully attained self-rule, the Netherlands refused to recognize the new country until the 1839 Treaty of London. Rumsey 4224.014 (1830 edition). Philips (Atlases) 758. Ristow, W., American Maps and Mapmakers: Commercial Cartography in the Nineteenth Century, p. 303-09.